Targeted audience • Specialists in numerical computations, especially in numerical optimiza­ tion, who are interested in designing algorithms with automatie result ver­ ification, and who would therefore be interested in knowing how general their algorithms caIi in principle be. 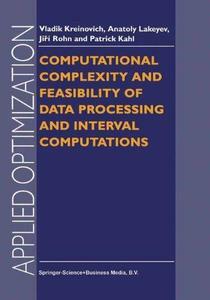 • Mathematicians and computer scientists who are interested in the theory 0/ computing and computational complexity, especially computational com­ plexity of numerical computations. 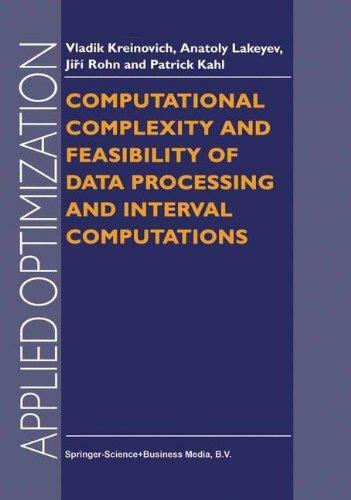 • Students in applied mathematics and computer science who are interested in computational complexity of different numerical methods and in learning general techniques for estimating this computational complexity. The book is written with all explanations and definitions added, so that it can be used as a graduate level textbook. What this book .is about Data processing. In many real-life situations, we are interested in the value of a physical quantity y that is diflicult (or even impossible) to measure directly. For example, it is impossible to directly measure the amount of oil in an oil field or a distance to a star. Since we cannot measure such quantities directly, we measure them indirectly, by measuring some other quantities Xi and using the known relation between y and Xi'S to reconstruct y. The algorithm that transforms the results Xi of measuring Xi into an estimate fj for y is called data processing.